This volume covers the current status of research in the neurobiology of motivated behaviors in humans and other animals in healthy condition. This includes consideration of the psychological processes that drive motivated behavior and the anatomical, electrophysiological and neurochemical mechanisms which drive these processes and regulate behavioural output. 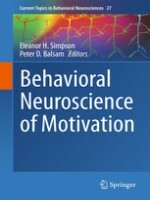 The volume also includes chapters on pathological disturbances in motivation including apathy, or motivational deficit as well as addictions, the pathological misdirection of motivated behavior. As with the chapters on healthy motivational processes, the chapters on disease provide a comprehensive up to date review of the neurobiological abnormalities that underlie motivation, as determined by studies of patient populations as well as animal models of disease. The book closes with a section on recent developments in treatments for motivational disorders.